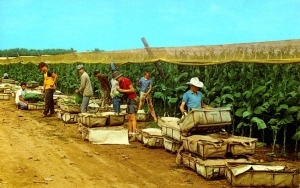 Creators: Cuteicolor 3-D Natural Color Reproduction and Kopplemann, H. P.
Description: Color postcard shows a group of young men picking shade grown tobacco in the Connecticut River Valley. Canvas baskets full of leaves are pulled between the rows and out to the edge of the field. Waiting wagons or trucks transport the leaves to the tobacco sheds.